Lori Parkinson is a History and English teacher as well as Teacher-Librarian in the Peel District School Board. She studies history and the world with a critical social justice lens. Lori is passionate about sharing her learning journey with her students. 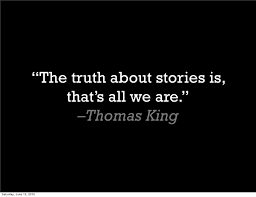 This fall, after a suggestion from Jasmine Wong from Facing History and Ourselves, I decided to explore The Truth About Stories: A Native Narrative, by Thomas King with my grade 11 English students. I was familiar with the text but it would be the first time I would be using it in my classroom. When I was in school we were rarely encouraged to be critical thinkers and we certainly were not encouraged to seek out the stories that make up our land. My goal was to learn with my students and explore and make connections. I was going to use the idea of the Oral Story as my jumping off point.